The ATA Dream Team lists out the keys to victory before every match. Preparation is defined as: to put in proper condition or readiness. It is often the difference between achieving your goals and falling short. It would be hard to imagine that any team takes preparation more seriously than the ATA Dream Team from Austin, Texas. The team trains at the Austin Tennis Academy and Owner/Team Manager Jack Newman wants to make sure all of his kids are prepared not just on the tennis court, but in school and in life. Each child prepares a "script" which is essentially a written game plan about how to approach various situations and events before they happen. When preparing for a tournament, players’ will have outlined everything from nutrition to in-game strategies and anything in-between. "When you identify and put your ambitions or objectives on paper they become real and not just thoughts," stated Newman. "If a player shares their goals, no matter how big or small, it becomes easier for that individual to become personally accountable because they will have support and encouragement from their teammates." Prior to a tournament or match, players will create a game plan on how to approach different in-game situations, singles versus doubles and even different styles of players. "I read my script several times a day and it enables me to just play and not think about what I need to do," said Josh Hager. "It eliminates chance and removes any doubt or second thoughts about what I’m doing." 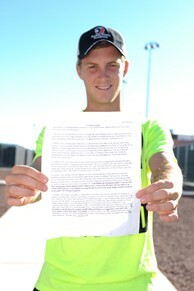 Aaron Chaffee, a high school senior, has found success with this approach on the tennis court and now uses it for academics. "My script translates very well to my schoolwork because I create an outline of everything I need to do, or improve upon, and I have something on paper to remind me." Jack Newman’s script for his team’s success appears to be paying dividends. The ATA Dream Team are the defending 18U Advanced Champions and placed 3rd the year before. They are looking to defend their title this year in Surprise.